I get asked this question a lot. Its a good question, but the problem is that its tough to give a good answer. - The heat loss from your home -- that is, how well its insulated and how big it is. - Your local climate -- both how cold it is and how sunny it is. - The percentage of solar heating you want to achieve -- the Solar Fraction. If you live in a cold climate with not much sun in the winter and have a large and poorly insulated home, you might have to cover half the county with collectors to get a high Solar Fraction. On the other hand, if you live in a in a good sun place (say Denver), and have a modest size and well insulated home, the collector area needed for a good Solar Fraction will be far far far less. 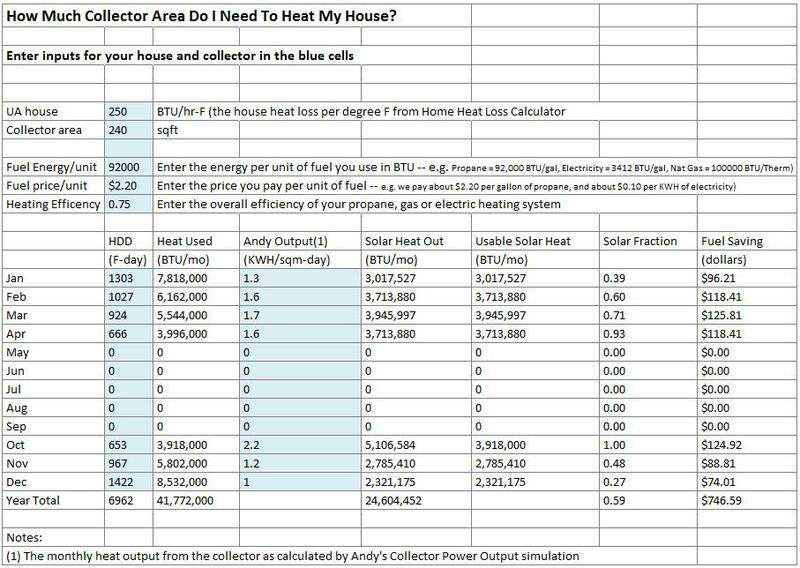 The method basically uses Andy's simulation tool to estimate the heat output for the collector installation you are considering, and uses the Home Heat Loss Calculator to estimate how much heat your house is losing. 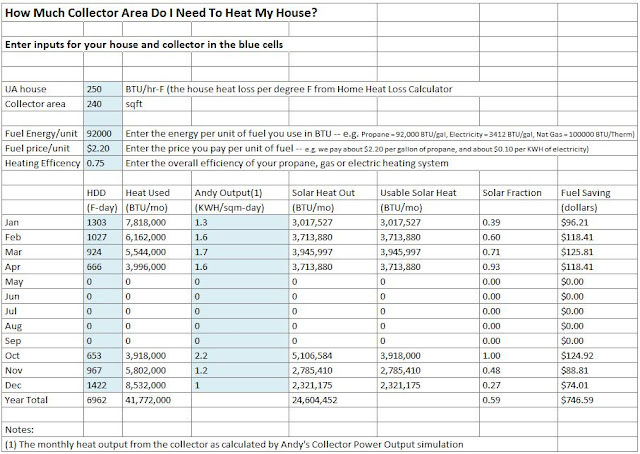 Entering the results from the simulation and heat loss calculator into a small spreadsheet then gives you an idea of the fraction of your heat demand you can get from solar for the collector area you specify. The end result is a month by month estimate of 1) house heat demand, 2) solar heat output, 3) solar heating fraction, and 4) fuel dollars saved. I think that the main value of the method is that it allows you figure out the best place to spend your money on energy saving projects. Are you better off to reduce your home heat loss with insulation and sealing projects, or would a solar heating system save you more, or is some combination of the two the best way to go? Andy Schroder has made available a very useful simulation tool that allows you to estimate the heat output of an array of solar thermal collectors that you specify. The simulation takes into account the specific collector you are using, the collector orientation, the water temperatures you want to produce, and the hour by hour weather in your location. 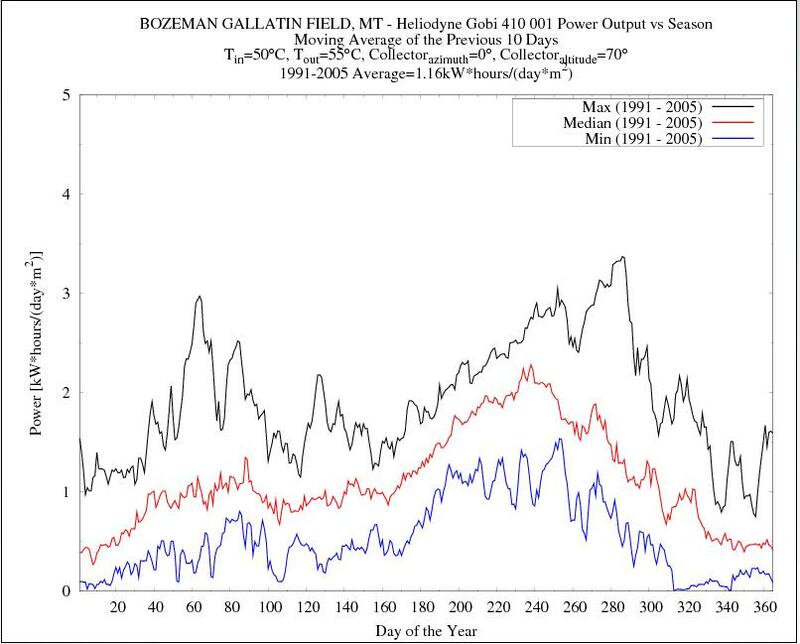 The simulation uses weather for the period 1991 through 2005, and provides best year, worst year and median year daily heat energy outputs. This can be a very helpful tool for getting an estimate of how much energy, fuel, and CO2 a solar heating system will save. To the best of my knowledge, this is the only easy to use and widely available tool out there that can provide a good estimate of the output of a collector array for your location and setup -- its a very welcome addition to the tool inventory. Thanks very much to Andy for developing this and making it widely available. Andy's server has been having some problems just lately, which will be fixed, so if you have a problem getting to the simulation link, just wait a bit and try again. All the posts from the old blog should be here along with all the comments. If you were subscribed to the old one, you will have to re-subscribe to this one -- hopefully the subscribe function works better on this one than the old one did. The subscribe button is way down at the bottom of the page. To add comments to blog items you will have to do the registration thing again, but this one does accept the OpenID, so you may find that your Google or Yahoo account username and PW works here. I've been doing some simple testing of thermosyphon solar heating systems that make use of our two homemade collector designs. The idea being to see how these collectors would perform in a thermosyphon system and just to learn more about thermosyphon systems. For thermosyphon systems, the heated water storage tank is placed above the collector. The inlet of the collector is connected to the bottom of the tank, and the outlet of the collector is connected to the top of the tank. collector and into the tank. The water leaving the collector is replaced by cold water from the bottom of the storage tank. As long as the sun continues to heat the water in the collector, a circulation loop is setup in which water flows continuously out the bottom of the tank, through the collector, and then back into the top of the tank. occurs since the water in the collector is more dense than the tank water and naturally stays in the collector. So, in this system, the circulation is all by natural forces -- no pumps needed. And, the control is automatic -- no controllers needed. These systems are very simple and are widely used in some parts of the world. Please read all the details from the links above if you have an interest in this, and maybe you can help answer some of the outstanding questions. - The collector that uses the PEX tubes is probably a bad choice for this thermosyphon application. 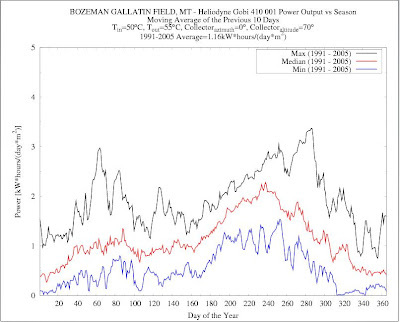 The collector temperatures observed would likely result in a short life for the PEX tubing. - The copper tube collector with the top/bottom manifolds and vertical risers worked well, and would likely be a good candidate for a homemade collector in a thermosyphon collector. There were some anomalies that showed up in the performance logging -- maybe you have an idea what is causing these? Over/Around Window Solar Air Heating Collector -- Help! folks have a strong interest in a solar air heating collector that works in conjunction with a regular window. This is based on the long term popularity of the "Heat Grabber" collector that MEN published a number of years back. While the Heat Grabber has been popular and works well, it does suffer a bit from limited collection area and, also because it sticks out from the building, which does not fit some situations. So, the MEN folks are interested in anyone's ideas on how to improve the design. The link below is my rough first prototype effort at a solar air heating collector that could be installed over a regular window. The idea is to use the existing window to get air into and out of the collector. This avoids any need to cut holes in the wall for vents. It also makes it feasible to just install the collector over the winter. Some design "challenges" remain. So, have a look, and if you have any ideas to improve this design or have an alternative design, please leave a comment, or email them in. The first cut prototype over/around window collector. The air ducting and screen absorber for prototype collector. Some unique new tools for collector making, including a homemade "Tee Puller', and new designs for forming and clamping the collector fins to the collector tubes. Use of a surplus stainless steel bulk milk tank for heat storage. The system is built using the Solar Shed concept, meaning its a separate building that acts as both a storage or garden shed, supports collectors and provides space for the heat storage tank. The two pictures below show the folding collector feature. The top photo shows collectors folded out for winter -- 8 active collectors. The bottom photo shows collectors folded in for summer -- 4 active collectors (along with Kenneth). Kenneth made a tool for drawing a Tee out of a copper collector manifold part -- this allows the collector risers to be connected to the manifold without using reducing Tee fittings or brazing. Kenneth used a 750 gallon surplus stainless steel bulk milk tank for heat storage. The tank is mostly buried (to allow drainback from collectors) and insulated with 4 inches of polyiso insulation.